Spring is here and it’s time to get that bike out of the garage and back on the road. Better yet, get it onto a bike trail, where you don’t have to worry about traffic and can just ride and enjoy the view. While the Burke-Gilman is the local go-to, why not go a little farther afield and explore a new place? We’ve got the trail for you: the Yelm-Tenino Trail, 14 miles of flat, paved biking goodness. It’s the perfect first ride of the season for all levels or riding and all ages, with some nice views and some cool places of interest along the way. Start your adventure in Yelm, located just outside Olympia. This works as a great day trip from Seattle, but an even better overnight. We recently headed down on a Friday night, and checked into the charming Prairie Hotel. With that as home base, we strolled over to the neighboring Uptown Lounge for dinner and drinks, and caught a movie at the connected Yelm Cinemas. (It’s one of those places with the giant recliner chairs, for maximum movie watching comfort). We woke up Saturday morning and headed out to the trailhead, located directly behind the Yelm Skate Park and Yelm City Hall, a short ride from the hotel. The trail is an old railroad grade trail, so you know elevation changes will be minimal, and there won’t be any sudden turns. The trail, which runs roughly parallel to State Route 507, unwinds past farms, wetlands, a golf course and parks. About five miles from the start, we stopped at the small town of Rainier. Just one block off the trail is the Main Street Cookie Company, which is worth a stop for some homemade sweets. Back on the trail, we passed McIntosh Lake, a popular fishing spot where you can expect to see many types of waterfowl. But your destination of Tenino is not far beyond. When you arrive, your first stop should be the Depot Museum, where you can see memorabilia from the town’s history, including a press used to make wooden money - a relic of the Great Depression days but still legal U.S. tender. 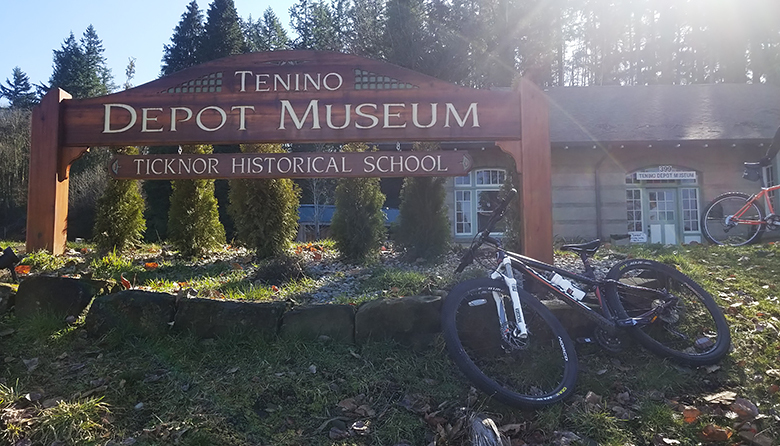 The museum is actually located in the City Park of Tenino, and next door is the Quarry Pool, natural lake in an old sandstone quarry, that we can’t wait to try this summer when it’s open. Just one block from the park is the main drag of Tenino, which is a charming step back in time. We stopped at T-9-0 Pizza, where the dough is made from scratch, and the cheese is from a local dairy. After a pizza lunch, we explored the town, and then landed at the Scatter Creek Winery and Brewery. Yes, that’s right, they are one of the few places in Washington that is both making wine and brewing beer. Owners Terril and Andrea Keary made us feel at home as we tasted some of their many wines and beers. Scatter Creek is like the town’s living room — everyone will stop by at some point to say hello. After we enjoyed the day in Tenino, it was back on the trail to Yelm, as we worked off the calories we’d consumed. We covered the 14 miles back to our starting point in no time, and were home in Seattle by evening. The perfect first riding day of the season!